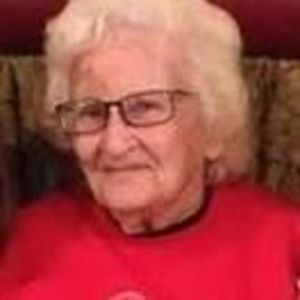 Goldie Agnes Haskins Acuff, 89, of Staley, passed away on Wednesday, April 26, 2017 at Clapps Nursing Home of Pleasant Garden. A funeral service will be held on Saturday, April 29, 2017 at 12:00 p.m. at the Loflin Funeral Home Chapel. The burial will be following the service at Staley Cemetery. The family will receive friends on Friday, April 28, 2017 from 6:00-8:00 p.m. at Loflin Funeral Home of Liberty. Agnes was preceded in death by her parents, Naomi Ruth Nelson and William Arthur Haskins; husband, Clifford Thomas Acuff; daughter, Twilla Suzette Defriess and son, Cecil Edward Burton. She is survived by her daughter, Sandra Anderson Groat; son, Fredrick Leonard Burton; grandchildren, Matt Burton, Carrie Burton, Kristen Ingold, Kelly Trexler, Jason Burton, Justin Burton, Jessica Defriess, and Nick Anderson. Agnes also leaves behind 10 great-grandchildren. In lieu of flowers, memorial contributions may be made to Clapps Nursing Center, 5229 Appomattox Road, Pleasant Garden, NC 27313. Loflin Funeral Home of Liberty is honored to serve Agnes's family.